I suggest you to explain the case (with YFull and STR data) to Igor Rozhanskii ( igorrozhanskii@gmail.com ). I can post his Y-STR matches from FTDNA database in 2 days. It takes some time. Slavic subclade in China has many scenarios. In this case it seems to be footprint of Mongolian expulsion politics of their empire period. Many people from Eastern Europe were moved to Mongolia and that is the one of the paths. Thank you for all your warm help, dear friends. I compared your 37 markers with FTDNA database. For lost values (DYS458 and DYS576 I filled typical ones, 17 and 16). You have two close matches (kitnum E14123 from Germany and kitnum N21955 from Denmark). Your genetic distance per 37 markers is 7. Your paternal ancestry seems to be German. You can find more info in Wikipedia about early contacts between China and German-speaking countries in 16-17 century. Mr.Farroukh thanks for you advice. According to GD=7 with German guys your most recent common ancestor (MRCA) lived more than 15 generations ago (~450 years, 16th century). It's about 44 generations ago. Suggested values for the average mutation rate per marker per generation are given below. These are estimates from all available sources by the author as of October, 2006 and except for the FTDNA 12 set are still not very well determined. The SNP rates are particularly poorly known. More up to date estimates can sometimes be found in the Rootsweb genealogy-dna mailing list archives. 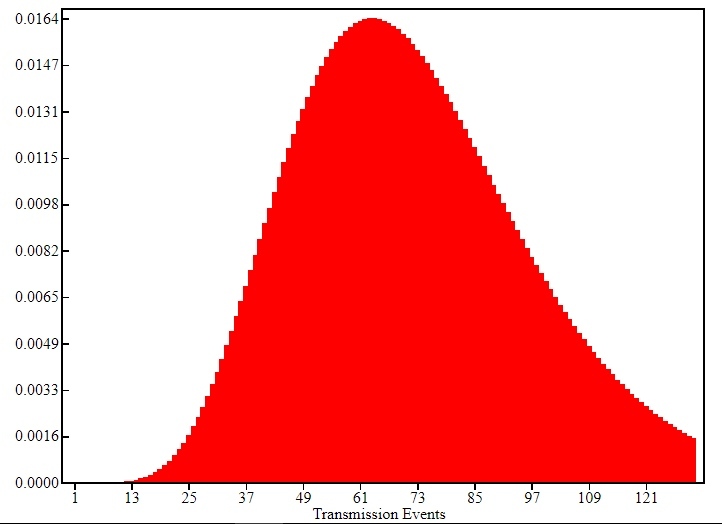 1 generation -= 2 transition events. I recently did a Wegene test(similar to 23andme) for my dad. His mt DNA is also M, M7b1a1h. What about his ethnicity results? Any surprises? Or 100% typical? His mt DNA is also M, M7b1a1h. Is his direct maternal line from southern China ? Yes, no surprise I think. 98.65% Northern Han, 1.31 Inuit. Even at DNA.LAND, I have a 1.6 Mid-Turkic (belong to Western Europe) and he does not, he only has 1.1 East Turkic. M7b is widely distributed in southern China, but my grandmother comes from a village in southern Luoyang, Henan, which belongs to northern China. CTS3402 (R1a1a1b1a2b3) has recently added one Chinese sample. At present, there are 37,000 samples, CTS3402 have 5people, three Chinese, my father and I, "李" and two foreigners. "Juntke" belongs to R1a1a1b1a2b3d, YP314. R1a1a1b1-Z283+ have all 19 samples,It looks like 5 foreigners 14 Chinese. Maybe “李” have the same downstream with me, but I can't contact him yet. I hope I can contact him oneday and compare our STRs first. YP340 from Kyrgyz, very interesting, what do you think about this?